Recently, the National Center for Education and the Economy (NCEE) gave a press conference to announce the release of their new report: "Tough Choices or Tough Times" and they introduced their new unelected, undemocratic, unrepresentative front group to promote it: "The New Commission on the Skills of the American Workforce". Their "partners" are from the Who's Who of Education, Business and "Philanthropy" so they can't be dismissed. These are the people who have been designing and implementing education reform for the last 30 years or so (gee.. thanks. We have the least educated young people in developed world). The reform that they are proposing is actually the 'locking piece' of a system that is the culmination of over 30 years of planning and phased implementation. It is a giant leap to the communist system of a planned economy and a controlled society. Sounds pretty outrageous doesn't it? Well, fasten your seat belts because I'm going to try and connect this up for you. I recommend that you read Step 10 at least twice. Then let a day pass and read it one more time so that you really grasp the enormity of what they are saying. They want regional authorities to direct the economic activity (i.e. businesses) in their territory and to coordinate the education of workers to correspond to their development planning. Step 10: Create regional competitiveness authorities to make America competitive. ... It is now clear that the most effective strategies for economic development are technology based and regionally focused. It is also clear that the most effective way to provide a real future for people who need jobs is to provide training that is related to the economic future of the region those people live in, for jobs in growth industries. So the Commission recommends that the federal government develop legislation to encourage the states to create regional economic development authorities involving key leaders from many sectors in those regions in the development of economic development strategies that make sense to them. These authorities would not only be responsible for coming up with development goals and strategies for their regions, but also for coordinating the work of the region's education and training institutions to make sure that each region's workers develop the skills and knowledge needed to be successful in that labor market. We settled on the word "authorities" to describe these new bodies because we wanted to convey the idea that they need to be more than debating societies. They need to be able to raise and spend the money needed to develop their regions over time. If these new bodies are as successful as we think they will be, the federal government should consider lifting many of the restrictions on the separate programs they will administer and permitting them to combine the funds from these programs in ways that are more likely to lead to both strong economic growth and strong job growth, especially for the most vulnerable people in the country. The Texas Workforce Investment Council (Council) assists the Governor and the Legislature with strategic planning for and evaluation of the Texas workforce development system; promotes the development of a well-educated, highly skilled workforce for Texas; and advocates the development of an integrated workforce development system that provides quality services. The Council also serves as the State Workforce Investment Board under the federal Workforce Investment Act of 1998. Council products include a strategic plan for the workforce development system, annual evaluation reports and resource publications, and occasional papers and reports on critical emerging issues. 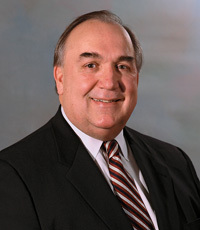 John Engler is a member of the New Commission on Skills of the American Workforce as well as supposedly representing American Manufacturers. NAM - glossy on 2007 Agenda - "Investing in America"
While Engler was giving his presentation supposedly as a representative of 'American' manufacturers, the truth is that he represents Chinese manufacturers that used to be American corporations. Recently he held a press conference to give NAM's 2007 Agenda for the Congress. When you listen closely to Engler, you can't help but hear the fraud and duplicity in what he says. To the right, you'll see a couple of audio clips showing how Engler is speaking out of both sides of his mouth. He talks about the plan for schools to make America competitive but then he advocates increasing H1-B visas to import cheap labor. He talks about making American manufacturers competitive but then he talks about the multi-modal, international transportation system that will facilitate bringing imported Chinese products into the country faster. The term "high performance schools" has a very specific meaning. It refers to vocational education which is what the NCEE school reform plan is all about. It is about "skills training with certifications" for the workforce - not about education. Engler answering a question on education during the Q & A part of the presentation. In his answer, he mentions his participation New Skills Commission and the the Tough Choices or Tough Times report. Engler talking about infrastructure 'improvements' they intend to pursue. Clearly what he is talking about is the Trans-Texas Corridor, the NAFTA super-highway TO BRING GOODS IN FROM CHINA! He also talks about "creative financing" to get some of the value out of building infrastructure - obviously he is talking about selling U.S. highways to foreign corporations. U.S. taxpayers build them, then these bastards sell them - and you can bet they are pocketing the money - it does not go back to the U.S. taxpayers. A few months after Bush's 1991 address, a group of CEOs created the New American Schools Development Corporation. Furnished with $130 million in contributions, they aimed to shake up "the nation's stagnating education system with the entrepreneurial spirit of the private sector." In 1993 billionaire publisher Walter Annenberg upped the ante with a $500 million pledge for public schools. A year later, IBM introduced its Reinventing Education initiative; during the next decade, it invested $70 million in the program. Since its 2000 inception, the Bill and Melinda Gates Foundation has distributed more than $600 million to 1,457 high schools and committed more than a $1 billion to the Gates Millennium Scholars program, a college scholarship program for low-income minority students. Hewlett-Packard has contributed hundreds of millions of dollars in equipment and cash to schools and universities. Wal-Mart donated $40 million to education-related causes in 2003. According to the Foundation Center, a nonprofit organization that compiles information on U.S. philanthropy, elementary and secondary schools received $1,176,520,000 in grants during 2002, or roughly 7.4 percent of all distributions that year. What is a corporations main goal? What do corporations know about education? What do the corporations who participated in the New American Schools redesign challenge specialize in? What did they come up with for a redesign of the public schools? Employers are considered the customer and the new 'education' system is designed to accommodate their desires. That's why it is integrated with the state Workforce Development Departments (formerly the state Employment Offices). It is a Supply Chain Management system that produces 'workers'. It is data-centric assessing and measuring 'the product' becomes the goal because these corporations design computer systems and it was a natural. It is like corporate skill training because certificates are earned for 'skills'. The certificates become attributes of the product: 'worker' in the integrated education/workforce development system. Teachers don't seem to realize that the ultimate goal is to eliminate them to the extent possible with Internet-based education software. On-The-Job training is to replace the classroom. Will the taxpayers save any money on this 'New Education System'? Please... be serious. Refer to the first question. Will the 'product: worker' be better educated? Most students will be barely, functionally literate. Because this system was designed for employers, 'workplace skills' will be taught from K-12 which means that they will be taught the same things year, after year, after year. The concept of the redesign was sold on the basis that we needed better educated workers for 21st Century New Economy. Supposedly, the majority of workers would be involved in technology and the Information Economy. SURPRISE! The 'New Economy' was a fraud. Globalization is sending technology and information technology jobs to third world countries for their cheap labor. In 2004 Catherine Austin Fitts was interviewed on the Jim Puplava radio program to talk about U.S. government finances and mismanagement. Fitts is Founder and President of Solari, Inc. And organization designed help promote 'healthy local living economies'. Former background: Managing Director and member of the Board of Directors of the Wall Street investment bank, Dillon and Reed. She was also Assistant Secretary of HUD under the first Bush Administration. In the mid-90's Jim, we knew that a huge amount of jobs and income-generating activities in America were going to get outsourced to Asia. I mean, those decisions were made in the early 90's, and we knew that was going to happen. And I was a leader in Washington promoting a model whereby Americans paid down their debt, refinanced their communities and themselves on an equity basis, and redeveloped their skills. I mean, we knew the workforce was going to have to reengineer itself, and our pension funds and retirement arrangements were not going to be financially credible unless the workforce reinvented itself, and paid down its debt, you know, then. So we knew then we had a problem. And what happened is was my team was kicked out of Washington, and a decision was made instead of reengineering folks, skills, or migrating them to equity and starting new businesses, a decision was made to float the economy of the biggest wave of debt that I can imagine. And what we've done is we've seen consumer debt skyrocket. Now, when you move all your income abroad, and you leave your growing debt at home, it doesn't take long to understand what's going to happen to a Fannie Mae or Freddie Mac or a Ginnie Mae. At some point the growing debt has got to get serviced, and the question is how? You can flood the country with immigrants who can buy up real estate that you finance at the bottom, but at some point something's got to give in the middle. I mean, if you shrink and collapse the middle class, they're going to default on their mortgages. The U.S.-India Business Council and the Federation of Indian Chamber of Commerce and Industry (FICCI) are pleased to announce the Knowledge Trade Forum, the culminating event of the Knowledge Trade Initiative (KTI), to be held in Bangalore, India, November 29-30, 2001. The KTI was launched during President Clinton’s trip to India in March 2000, and was subsequently organized under the auspices of the USIBC and FICCI. The KTI is a bilateral forum between India and the U.S. to discuss key issues affecting the trade of knowledge-based products and services between the two countries. The KTI aims to solidify Indo-US leadership in the knowledge economy by harmonizing bilateral positions on key issues affecting knowledge trade. The Forum will also provide the backdrop for the presentation of the final report of the KTI. The KTI has formed a series of working groups to consider key policy areas that affect the trade in knowledge-based products and services. Over 150 international experts in each of their fields have met regularly over the past months coming up with policy recommendations for India and the U.S. to secure their positions as leaders of the new economy. A trade agreement with India having to do with knowledge jobs and Information Technology using 'terrorism' as the reason is a Great Non Sequitur. "More than 250 Fortune 1000 US companies now depend on Indian IT companies for their mission critical work," said Richard F Celeste, US Ambassador to India. "The partnership between India and the US has strengthened into a 'relationship' today because we share common values and devotion to democracy. This relationship is enabled by the revolution in technology and Internet," he said. "This is a kind of DNA infusion from Indian subcontinent to the United States. The percentage of Indian graudates coming to the US is increasing every year and more number of these students are coming back to India to work," said Celeste. He was speaking at the Nasscom 2001 international IT conference in Bombay recently." The point here is to show that the game plan still includes importing goods from China which is killing our manufacturing base and it includes importing cheap labor from foreign countries on visas. It includes the continuation of exporting technology and knowledge jobs to third world, cheap labor countries. The bottom line to education reform is that they intend to privatize it - drain the money out of it - replacing real education with vocational training as dictated by the "regional competitiveness authorities". The only way for a "regional competitiveness authority" to plan the economy in a region to ensure jobs for the young people they train in their soviet poly-technical schools is to have a "zone" where they can dictate the types of businesses that will either be funded or will be allowed to operate in their "zone". These 'regional authorities' will be the Lords and Ladies over economic zones called Foreign Trade Zones, HubZones and Intermodal Commerce zones. They are given exemptions from taxes and other regulations to give them an unfair competitive advantage, thereby putting legitimate American businesses out of business. This is the way the American economy will be converted to a planned and controlled (communist) system. "The HUBZone Empowerment Contracting Program stimulates economic development and creates jobs in urban and rural communities by providing Federal contracting preferences to small businesses. These preferences go to small businesses that obtain HUBZone (Historically Underutilized Business Zone) certification in part by employing staff who live in a HUBZone. The company must also maintain a "principal office" in one of these specially designated areas. [A principal office can be different from a company headquarters, as explained in our section dedicated to Frequently Asked Questions.] The program resulted from provisions contained in the Small Business Reauthorization Act of 1997." While researching HubZones, I stumbled on to the story of a woman named Payal Tak. After listening to a couple of Senators talking about how American farmers in their area desperately need help to stay in business, I wrote this story about Tak. Be sure to scroll down and look at her earnings history. That preferential treatment for government contracting - not bad eh?